Fort Laramie is best known for the forty one years (1849 to 1890) it served as a military post and for its role in the western Indian Wars. The earlier “forts” that existed here are less known and understood, representing the fifteen-year fur and robe trade history of the site from 1834 to 1849. In the spring of 1834, “Fort William on the Laramie” was established by fur traders as a stockade made from cottonwood logs. In 1841, a replacement structure, “Fort John,” was built using adobe bricks. In 1849, the U. S. Army bought the structure and established a military post that became known as “Fort Laramie,” which existed until 1890. 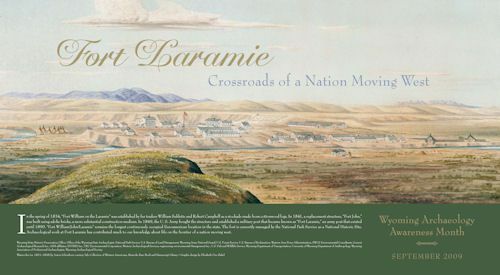 While not the earliest Euroamerican settlement in what we now know as Wyoming, “Fort William/John/Laramie” remains the longest continuously occupied Euroamerican location in the state. In 1835, Sublette and Campbell sold Fort William to another fur trading company called Fontenelle, Fitzpatrick & Co, who, in turn, later sold it to Pierre Chouteau and the American Fur Company in 1836. The American Fur Company, and their trapping brigade known as the Rocky Mountain Outfit, operated out of the fort until 1841, when competition caused them to rebuild. Lancaster Lupton, an independent trader, had built an adobe fort just north of Fort William, and began trade with the Indians. By this time, the log stockade of Fort William was deteriorated and provided little real protection to its occupants. The shabby look and decaying features of Fort William were not good for business. In order to re-capture the trade, the American Fur Company invested $10,000 in the construction of a replacement. Completed in 1841, the large and impressive “Fort John” was opened for business. Named for a partner in the company, John Sarpy, Fort John was built of thick adobe walls surrounding a central courtyard, much like Fort William. By 1849, the flood of westward emigrants motivated the government to take steps for the safety and well being of the emigrants. A string of army posts along the trail could provide a sense of security, keep the trail open, and allow for reliable points of supply and repair. In April of 1849, the Regiment of Mounted Rifles moved into the old adobe fort after purchasing it from the American Fur Company for four thousand dollars. The forty one-year military period then began and what we now see and know as Fort Laramie was established. Fort John was the structure many of the Oregon/California Trail emigrants associated with Fort Laramie. It was the impressive structure seen at the south end of the parade ground throughout the early years of overland migration. As such, many more travelers sketched this structure. We thus have a much better record of what Fort John looked like than Fort William. One of the commonly asked questions from Fort Laramie’s visitors is “Where is the original fur trader post [Fort William] located?” The National Park Service and historians interested in the Fur Trapper Era during the western expansion of Euroamericans in North America have long asked this question. Despite the early depictions and descriptions of Fort William, the exact location of the fort has been lost to history. The only way the location of Fort William and many other early structures can ever be determined is through archaeological studies. Such studies are vital to understanding the full history of Fort Laramie from its beginnings in 1834. The first archaeological investigations at Fort Laramie National Monument began in mid-August 1938 by a CCC work force under the direction of G. Hubert Smith shortly after the property was designated a national monument. This early work at Fort Laramie National Monument set the tone for the following eighty years: construction or restoration work was always preceded by archaeological investigations or monitored for their archaeological content. More than 75 such projects have been completed and there is no end in sight. A recently completed geophysical survey of the central portion of the fort, including the area around all standing structures, revealed so much about the archaeology of Fort Laramie it would take more than 100 years of excavation and analysis to completely record the site’s archaeology. Morgan, D. & Harris, E. (1967). The Rocky Mountain Journals of William Marshall Anderson. The Huntington Library, San Marino, California.